The 44 edition of the Trofeo Princesa Sofia Mapfre for Olympic Classes which kicks off this Saturday, arrives with many novelties and in an unusual Olympic campaign atmosphere in a post-Olympic year, according to the Organisation at the official presentation to the media this midday at the Mapfre in Palma. The presentation was presided over by the Councillor of Public Administrations of the Balearic Islands Government, Simón Gornés; the Government Sports General Manager, Javier Morente; the Councillor of Sports of Palma City Council, Fernando Gilet, and the Naval Sector Chief and Naval Command in Baleares, José María Lavilla. They were joined by the Mapfre regional manager in Baleares José Antonio Continente and the Trofeo Princesa Sofia Mapfre CEO, Ferran Muniesa, as well as the president of the Federación Balear de Vela, Joaquín González Devesa and the presidents of the Organising Clubs, Gabriel Dolç from Club Nàutic S’Arenal, Juan Antonio Cardona from Club Marítimo San Antonio de la Playa and Joan Bonet, Commodore of Real Club Náutico de Palma. The regatta CEO, Ferran Muniesa, reminded that the Sofia Mapfre debuts officially in this new stage of the ISAF Sailing World Cup, “which has become more global with only two stops in Europe and the rest in the US, Oceania and Asia”, and has thanked the effort made by the team to make this a reality, “a team that has worked with the awareness of being able to offer one of the best Olympic Classes regatta in the world, thanks to the professional team, the quality of our facilities, the unbeatable weather conditions of the Bay of Palma and for the attention offered to sailors”, he said. Muniesa specially outlined the “indispensable support” from Mapfre, as main sponsor, as well as Seat, Helly Hansen, Pabisa Hotels and Balearia and thanked the collaboration of the Consejo Superior de Deportes, the Government of the Balearic Islands, Palma City Council and the Spanish and Balearic Sailing Federations. The Mapfre regional manager in Baleares, José Antonio Continente referred to his satisfaction for the sponsorship of the Princesa Sofia, “a good decision not only for business (Mapfre is leader in boat insurance in Spain and the insurance company of reference for the Clubs in Mallorca) but also for the pride of contributing to spread the name of Palma de Mallorca worldwide". 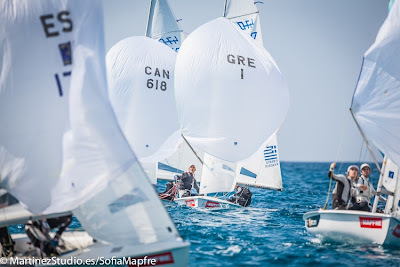 "Throughout these 44 years the Trofeo SAR Princesa Sofia has grown in many aspects: in ambition to become part of an Olympic classes world circuit; in participation and prestige with the presence of over 50 nations. We can say the Trofeo Princesa Sofia Mapfre is the sports week in Palma by excellence. We are proud to keep this regatta in the elite, something not at all easy in the present context of financial crisis "added Continente. Around 850 Olympic classes sailors from 53 nations, with the participation of Olympic champions and intercontinental medallists will sail in the bay of Palma from 6 April as a starting point of the Rio 2016 campaign. “These are record figures in a post-Olympic year in an edition that will see the two new Olympic disciplines, 49er FX and Nacra 17, so we will have the ten Olympic classes and one Paralympic class sailing in waters of Mallorca”, according to the Princesa Sofia Mapfre CEO. Due to the Class changes there will be many crews starting a new Olympic adventure at the Trofeo Princesa Sofia Mapfre, such as the London 2012 Olympic champions in Women’s Match Racing Támara Echegoyen, Sofia Toro and Ángela Pumariega. The testing of the Rio 2016 competition format, the distribution of all classes in two venues, Club Nàutic S’Arenal and Club Marítimo San Antonio de la Playa as well as the opening of the regatta to the society of Mallorca with a full programme of social activities to be held at the Pabisa Beach Club –the Sofia Mapfre social events venue- are other of the novelties presented in this edition with races scheduled from Monday 1 to Saturday 6 April.